If you are a traditionalist, Pearsall's Gossamer Silk Thread is your thread of choice. If you go to the fly tyer's dictionary and look up some of the most elegant and effective wet flies and soft hackles, you will see Pearsall's Gossamer Silk Thread listed in the fly formula as the thread to build the masterpiece. Pearsall's Gossamer Silk Thread is colorfast when you dab on your finish cement. Pearsall's Gossamer Silk Thread is about similar to a 6/0 thread and suitable for even very small flies. Pearsall's Gossamer Silk Thread is amazingly stretchy, take a section and gently pull on it between your hands to see just how far you can push it. Pearsall's Gossamer Silk Thread is available in close to or more than 24 wonderful subtle and bright colors. A bobbin for use with this thread? No, there is no single bobbin that is really adapted to use with these small o, but don't let that deter you. Here is how to resolve the bobbin lacking issue. Take your normal bobbin loaded with a non Pearsall's Gossamer Silk Thread thread. 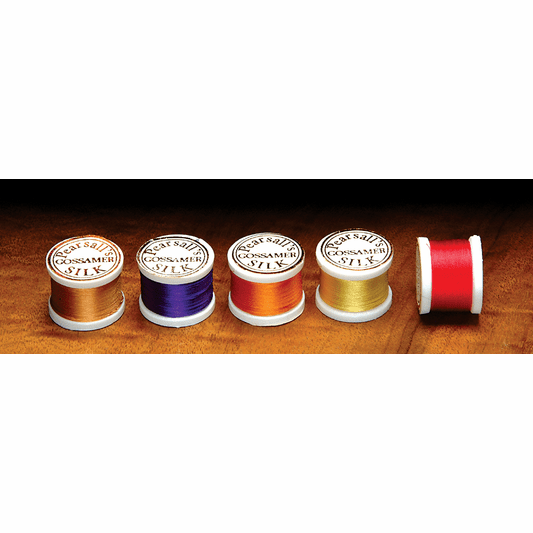 Align the tips of your usual thread with your Pearlsall's Gossamer Silk Thread thread, both facing the same direction. And by the way, this process works with ten feet of Pearsall's Gossamer Silk Thread as we as for transferring the whole spool of Pearsall's Gossamer Silk Thread to your old thread spool. Anyway, with the two threads aligned, simply tie a single overhand knot, trim all but 1/8" of the loose end and then wind the Pearsall's Gossamer Silk Thread onto your old spool. That is it, you are done. You now have your new Pearlsall's Gossamer Silk Thread on your old thread spool in your bobbin of choice. Go now, tie a soft hackle using Pearlsall's Gossamer Silk Thread for your body and never needing to add another material, unless of course you want to use a fine strand of Pearlsall's Gossamer Silk Thread Marabou floss for the body. And give some Starling feathers or a Metz Grizzly Hen Cape feather a try if you want a switch up from your usual Partridge for your soft hackle.